Alvin® Elite Table, White Base White Top 37.5" x72"
Home > Drawing Supplies | Drafting Tables | Alvin® Elite Table, White Base White Top 37.5" x72"
The Alvin Elite White Base W/37.5X72 Top is a top-of-the-line drafting desk. The 37.5” x 72” work surface is sizable, sturdy, and warp-free. Choosing a drafting desk that works for you is important. Many units don’t provide the workspace that you need. 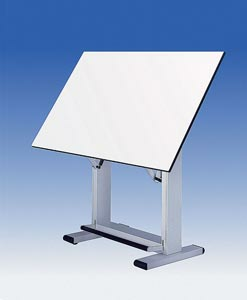 Alvin delivers with a drafting desk that has a 37.5”x72” work surface. Made from Melamine, it is strong and is warp-free, allowing you to work on it day after day. The base will allow you to adjust the top in terms of horizontal position as well as angle to ensure you are comfortable at your desk. The base is easy to keep clean and will provide you with the space you need to work on art, draft blueprints, and do anything else. Oversized shipping required: $166.50.